FAQ: Do you rent large water storage tanks? Question: Hello, I need temporary potable water storage. I need three 25,000 gallon water storage tanks to store water for about a month. Do you have collapsible tanks in that size? How large would they be? Do you rent them? Answer: The collapsible pillow tank is one of the most versatile storage options and has tanks in sizes up to 210,000 gallons. If you check on the Collapsible Tank Main Page, you will find a sizing chart with typical sizing for these tanks. Here you will see a 26,000 gallon tank size. The filled dimensions for a tank this size would be 34' L x 30' W x 3.5' H. This can give you an approximate size for a tank with a capacity of 25,000 gallons. Unfortunately, tanks are only available for purchase and are not available for renting. However, one the many advantages of these tanks is their economical construction and ability to be reused in multiple applications. Other customers have chosen the bladder tank for short term pool storage and then reused the tank for rainwater collection. While these tanks do feature several standard sizing options, the material and construction of the tank is extremely flexible. 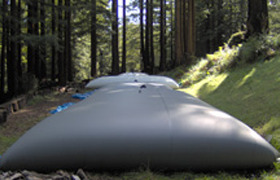 This means that a temporary potable water storage tank can be built to meet specific sizing requirements. If you do check out the standard sizing chart, you will find several columns separated out by a "recommended contact time". This time is a general rating given for various tank fabrics and is not designed to operate as a strict lifespan for the tank. Many tanks have been used well beyond their rated contact time.